1credit: Move any number of credits from your credit pool to Sealed Vault. click or trash: Move any number of credits from Sealed Vault to your credit pool. Nothing is impenetrable. The key is to make breaking into it more costly than what it's worth. 0 to rez + 8 to trash +1 influence ! These highly impressive values mean card could see a lot of play. Any number of credits can be moved from your pool to the vault without spending a click. This makes this card more versatile than Thomas Haas (who requests X/2 clicks to spare X credits). This card is the solution against Account Siphon and Vamp. Immune to Imp given you can trash by yourself to get your credits back. The flavor text says it all: "The key is to make breaking into it more costly than what it’s worth." Just book 7 credits on it. Will the corp pay 8? meta dependent: Card is useless if opponent does not play Account Siphon and/or Vamp. Executive Boot Camp allows you to play just 1 Sealed Vault in your deck, in order to minimize the con above. Sealed Vault is a silver bullet that shuts down Account Siphon (and Vamp). However, most players turn to the more flexible Crisium Grid that not only stops Account Siphon but can also deal with Keyhole. Having an extra economy card instead to help you recover from/mitigate Account Siphon isn't a bad shout either. 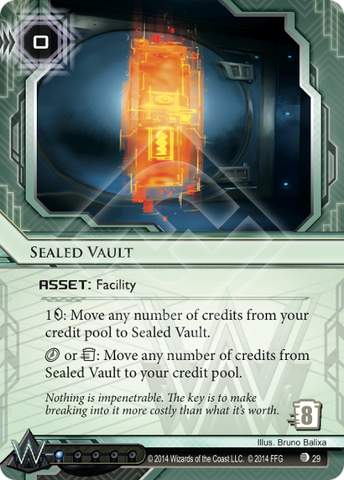 However, Sealed Vault's surprise factor should not be overlooked. A surprise rez means the runner still takes two tags they might not be able to clear. More importantly, it disrupts their plans and prevents them from capitalizing on the Account Siphon in a way that simply running more economy wouldn't. It goes without saying that this card is best in decks that are particularly vulnerable to Account Siphon. Rich corps or those with a well/decently defended HQ should bypass it. Overall, its application is too niche to see a lot of play, but when it fires, it really hurts.